The Nicobi Project follow-up work completed in 2017 identified two target zones to be the subject of additional ground exploration work in 2018. Zone A is glacially up-ice from copper and zinc anomalies in both till and rock samples. 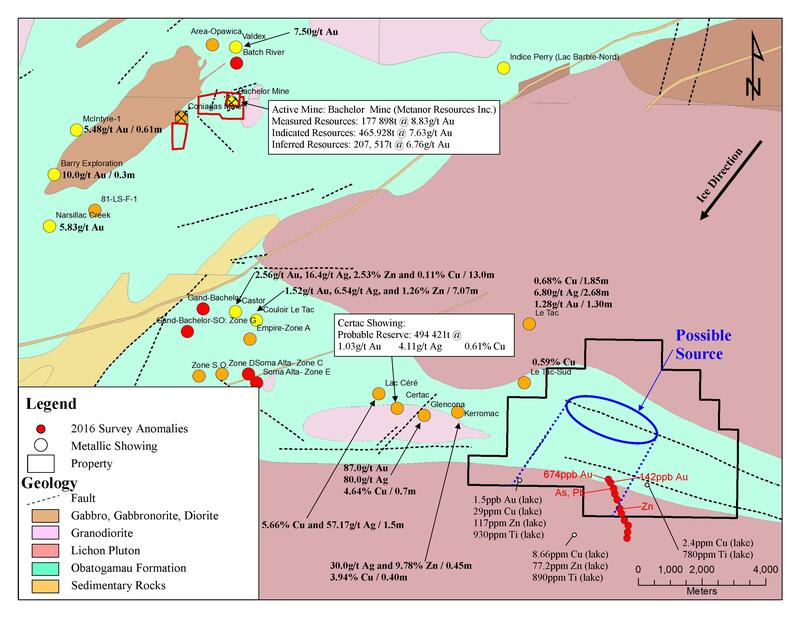 Zone B is associated with anomalous gold in till samples from both the 2016 and 2017 surveys. The Zone B-associated results led to the staking of 7 additional claims to fully cover the probable target area, glacially up-ice from the gold-anomalous till sample locations. Both target zones are accessible from a network of logging roads which cross the Nicobi Project claims. The Zone A till sample results are consistent with volcanic-hosted massive sulphide deposits known from numerous regional showings associated with the Doda shearing corridor, an off-shoot of the Casa Berardi Fault Zone. The local geology can be seen in the figure which accompanied the June 13 press release (https://www.evolvinggold.com/images/Figure_Geology.jpg). Zone A is superimposed on a probable fault intersection within the Doda shear zone, interpreted from regional aeromagnetic data. Zone A is depicted in Figure 1 at https://www.evolvinggold.com/images/nicobicuzn.jpg. Zone B is glacially up-ice from anomalous gold found in the 2016 till samples, as was confirmed with the 2017 till sampling survey. 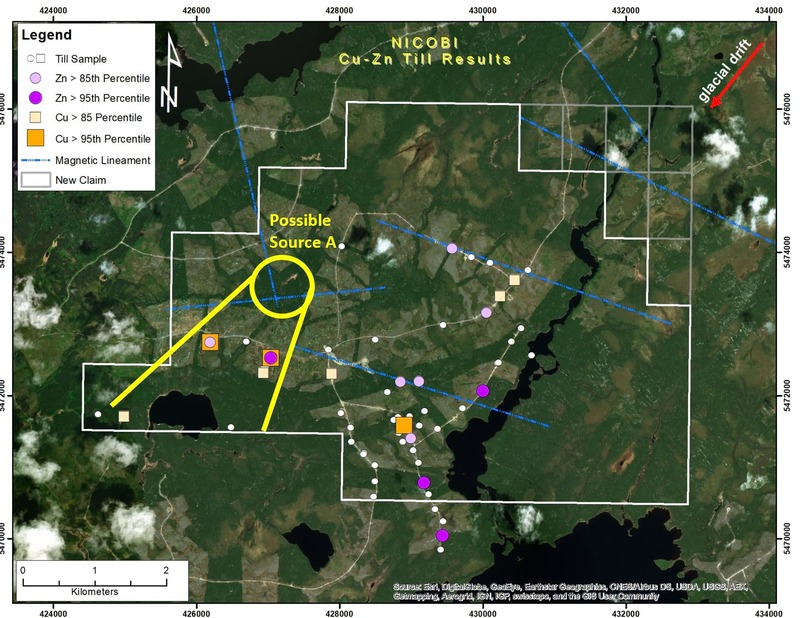 The gold source is expected to be located NE (up-ice) from these till anomalies, as seen on Figure 2 at https://www.evolvinggold.com/images/nicobiau.jpg. The Zone B exploration target zone is proximal to the contact between the well-mineralized volcanic Obatogamau Formation and the later-stage intrusive Lichon Pluton, and associated with magnetic lineaments which may be related to faulting. Please refer to the previously referenced map of the local geology for further information. Steven Lauzier, P.Geo OGQ 1430, A Qualified Person (“QP”) as defined by National Instrument 43-101 guidelines, has reviewed and approved the technical content provided in this news release. Evolving Gold recently acquired the 31.93 square kilometre (total area) Nicobi property, located next to Osisko’s Quevillon Property and about 18 km southeast of Metanor’s Bachelor gold mine. The Company’s exploration goal is to find precious and base metal deposits suitable for further development. 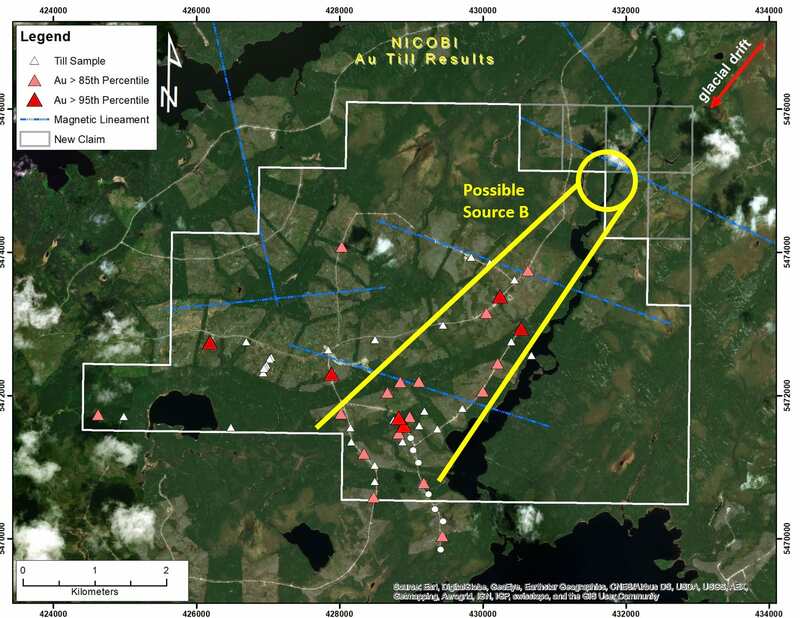 Evolving Gold is exploring the 72.5 square kilometre (total area) Lithium Lakes property in Quebec, located about 10 km north of the Route du Nord and between eight and 30 km from Nemaska Lithium's Whabouchi Project. The Company’s exploration goal is to discover economic quantities of lithium mineralization hosted in pegmatite. Next Post: Evolving Gold Signs Letter of Intent to Acquire Bocana Resources Ltd.